An interesting read from Guardian columnist Stephen Moss concerning his middle-age quest to "to see if playing better chess would make me a better person." Coincidently, this weekend I had just bought the latest copy of "Chess'' the British Chess magazine , which also had a long interview with him about the same subject. That was a good read, so the addition from the Guardian was appreciated. Its notable that his subtitle to "if it would make me a better person" is "I was unprepared for the pain of defeat", so you know this will be a warts and all description of what it feels like to be an enthusiastic amateur ! In fact, the article ( & book ) is more concerned with what chess can give you, to help in your life, rather than games and analysis, which makes it more of general interest. Moss makes some very good observations. For example, I am sure I fall into his category of players who played at ( or even for ) school, and achieved moderate success, but then dropped it for adventures in real life, until returning much later in life. The internet makes this return easier for sure, since you don't need visit a club, and can play as anonymously as you like, but eventually you need to get out to play real people, and experience the more personal aspects of the game. He has written a book on his experiences, called 'The Rookie', and on the basis of what I have read so far, I am certain it will be a worthwhile read. 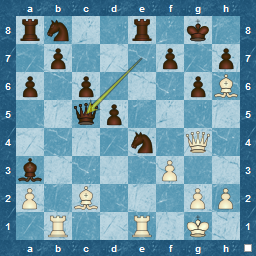 One thing I enjoy about a blitz game are those occassions when one side has the upper hand, but the other has an immediate riposte, like some "sword of Damocles", hanging over his opponent. Usually, this is heightened by the time factor : the attacking side could win easily with enough time to think, but that's the problem ! Here's an example from recent play. Black is more than ahead in material, but it seems like his Knight is pinned to his Queen, and a lowly pawn is about to regain the piece. But is there a simple way out ? Has Black just lost a piece ? Yes, there is ! 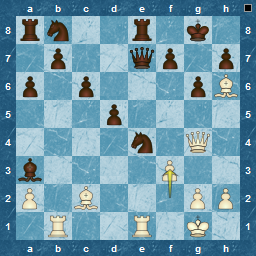 In fact more than one, but the Queen is the better piece to use, and 20...Qc5+ forces Kh1 ( of course, Kf1 is mate with Qf2 ). 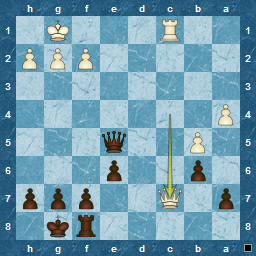 After Kh1, the Knight moves in for a check, forcing Kg1 allowing Knight takes Queen, and prompting a resignation. 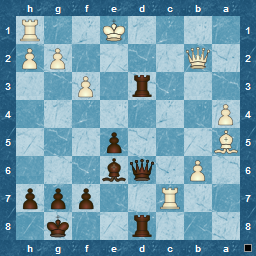 However, 22...Nxg4 is not the best move, though of course it crushes White's resolve and the game is over. 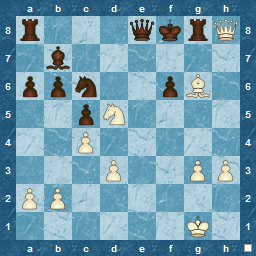 There is a much quicker and more elegant mate in 3, and the clue is in a previous post, if you need it ! 4 King pawn, 4 Queen pawn, and 2 others, Dutch and English. Hardly much of a change over the seasons in major openings played, with the split between King- and Queen-pawn, much the same as before, even the percentage is close, 51% for King's Pawn this season,compared to 53% : not a significant change. Oddest opening, at least from my view, is 1.e3, occurring 4 times. Appropriately, White won only 1 of these games ( and that was via a blatant Black blunder), losing 2 and drawing the other. Only 6 games in the King's Gambit, with a slight edge to White, but no Falkbeer Counter-Gambit this time around. 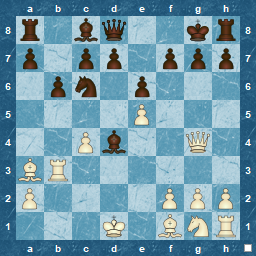 Eleven games played with less than 10 moves, but no traps, just over-looked tactics. 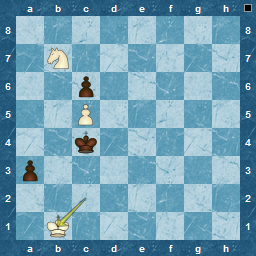 Longest game : 124 moves and decided by an unfortunate mistake by the knight-less side to leave a King, Knight and Pawns vs King and Pawns ending, which was played well on both sides until, as would seem inevitable, the knight endured at the end. 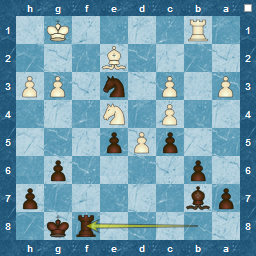 However, could it have been saved by Black at the 111th move ? Probably due to tiredness or time-trouble, Black played a2+,leading to a loss. 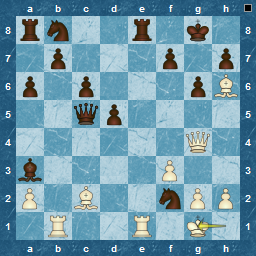 What should Black play to give himself a good chance of a draw ? The following is one of the few times that I really felt that there was something in the position that screamed for action ( and when I was proved correct ! ). The game had been uneventful. 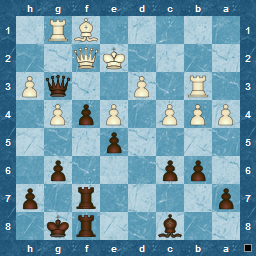 Black had attacked early, exchanged pieces and was out with his Queen, and his King in the centre: White is clearly better. However, as is often the case, I was at a loss what to do next. 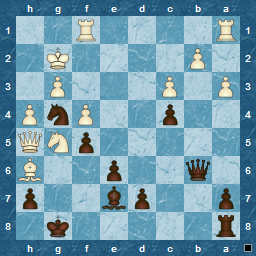 I admit I didn't calculate all of the combination, but I saw enough to reach a winning position, and then Black helped me with a weak move as well, since he had missed what I saw when I envisaged the combination. 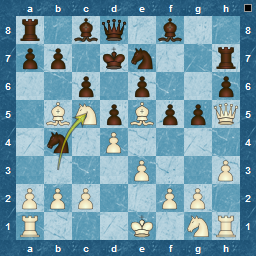 It might only be a blitz game, but it was a satisfying feeling to find and play a good combination ! 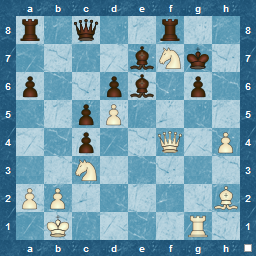 Christmas, New Year, time off work, new roles at work and just general living, have put this blog on a back-burner since early December, but just to show some sign of activity, for me, if no-one else, here are a couple of useful positions from a recent blitz game. 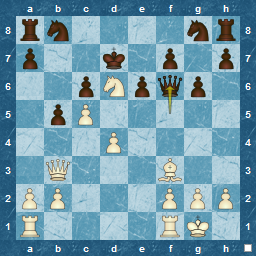 I had manoeuvred and, dare I say, planned to be in this position, with the intention of swapping off the Bishop for knight. 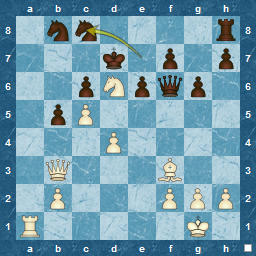 However, I missed a nice tactic, as I had too much focus on previous plans, rather than viewing the position.There is a much better move here than Nxe3 that I played. 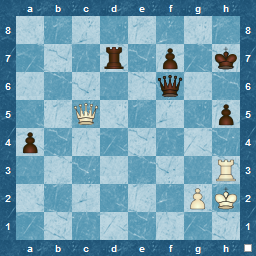 I won this game,but I missed the mate in two that was available, probably because of a lack of time ( down to about 10 seconds ). Its both hidden, because of the knight on d4, and obvious at the same. Any takers ? Out of interest, I used a new tool I found to write this post ‘off-line’', ie not via Blogger. Its new, based on ( possibly , inspired by ? ) Windows Live Writer, and just released in the last month or so. I think its a very neat piece of software, though possibly more useful for a more text orientated blog : view it at Open Live Writer.